The monograph presents the main results of the author’s sixty-year activity in science and engineering fields regarding the application of various multi-hull ships. The shown data are based mainly on the wide experimental results of the author. For fullness of description, some problems are explained in brief by the experimental results of other authors whose names are shown in the text and references. The scope of topics includes a brief history of applications, a list of types, hydrostatics and stability, towing resistance and propulsion in calm water and high seas, seaworthiness, maneuverability, external loads, structural arrangements and strength, general arrangement, and proposed concept designs. The scope of architectural types encompasses the variety of multi-hull “species” from catamarans to trimarans as well as the other triple-hull ships, and ships with a small water-plane area (SWA ships). The type and size of ship range from small fast crafts to large ferries, from passenger ships to transatlantic container-carriers, and from high-speed patrol boats to naval combat and auxiliary ships. 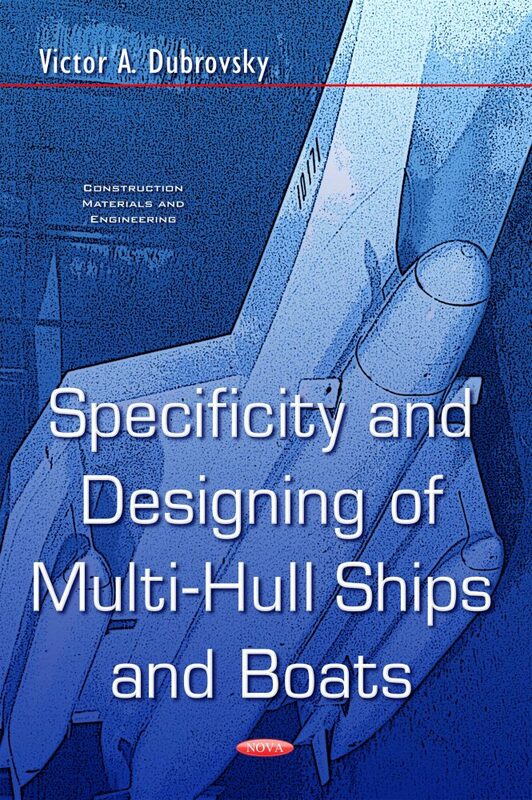 This is a development of a kind of technical encyclopedia previously published as three books: Multi-hull Ships by V. Dubrovsky and A. Lyakhovitsky (2001), Ships with Outriggers, by V. Dubrovsky (2004), Ships with Small Water-Plane Area, by V. Dubrovsky, K. Matveev, S. Sutulo, with detailed explanations of the newest data. In this respect, the book is unique and the most universal one written in English today. A brief history of applications is given as the base for future developments. The introduction contains a list of ship types and full terminology. Chapter One describes the specificity of general arrangement. Chapter Two speaks of how stability and non-sinkability differ clearly from the same qualities of mono-hulls. Chapter Three delves into resistance in calm water (major specificity and its use, series test results of catamarans with low-lengthening hulls, and twin- and triple-hull SWA models). Chapter Four is about seakeeping and performance on high seas (specifics of motion and the universal method of comparative evaluation). Chapter Five teaches readers about controllability and maneuverability specificity. Chapter Six shows structural strength (external loads, hull girder stress analysis and design, and simplified methods). Chapter Seven deals with d esign (basic factors, specific design algorithms and limitations, some new concepts: super-fast wave-piercing trimaran; “semi-gliding” ships with small water-plane area, S/P SWA ships, feeder and fast container-carriers, motor yachts, carriers of helicopters and unmanned aircraft; transatlantic container-carriers, cruise ships, passenger ships for unequipped coasts, ships for seismic researching, multi-purpose pleasure and inexpensive research vessels, some small-sized vessels, and combat ships from corvettes to aircraft-carriers). The book is intended for shipbuilders of any stages, from students up to designers and design managers and for sailors and ship owners.